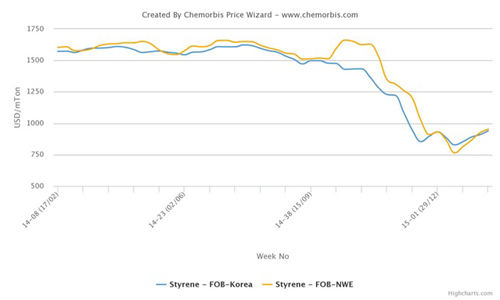 In Europe, spot styrene prices continued to gain increases during this past week and the cumulative increases seen on the spot styrene market have reached around $245/ton on FOB NWE basis, since the beginning of March as per ChemOrbis pricing service. These increases occurred despite the volatile crude oil prices, which went below the $50/bbl threshold during last week. Plus, European naphtha prices indicated $30-35/ton decreases since the beginning of March while spot benzene prices in Europe recorded rather modest increases of $15/ton over the same period. The main driver behind the rise of the European spot styrene market was the scheduled plant shutdowns. Although only a few plants are being shut, the cumulative capacity of the off-line plants is over 1 million tons/year. In France, Total Petrochemicals shut their 650,000 tons/year Gonfreville unit in late February. The producer had brought the shutdown date forward from initial plans. The plant is to be offline for four weeks. Meanwhile, Trinseo is planning to shut their 500,000 tons/year styrene plant, located in Netherlands, Terneuzen, by the end of March. The shutdown is expected to take 6 to 8 weeks. Synthos is also mulling over a maintenance shutdown at their 170,000 tons/year Kralupy styrene plant in Czech Republic in April. The duration of the shutdown has not been revealed, yet. 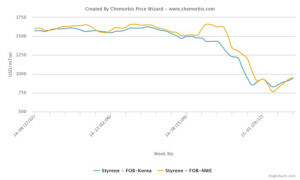 Meanwhile, in the downstream PS market, European PS producers revised their initial hike targets of up to €190/ton, slightly down to €175/ton, in line with the increase in March styrene contracts. According to ChemOrbis, the tight styrene supplies and the restricted PS availability in the region keep the market sentiment firm. A trader commented, “Overall supply levels are quite tight and producers are likely to close their order books soon.” A converter also confirmed restricted PS supplies and added that they are waiting for another round of increases in April given the styrene shutdowns.